Never-Before-Seen Featurettes And Much More! BURBANK, CA (June 2, 2015) – Ready to feast on this? Just in time for the season three premiere on The CW, Warner Bros. Home Entertainment will release The Originals: The Complete Second Season on Blu-rayTM and DVD on September 1, 2015. Season Two is also available to purchase on Digital HD. Averaging nearly 2.2 million viewers weekly, The Originals is one of The CW’s top shows this season. * Fans can get sucked in all over again on all 22 one-hour episodes from season two, plus over an hour of gripping extras — including the 2014 Comic-Con panel, featurettes, behind the scenes, deleted scenes, and a gag reel. 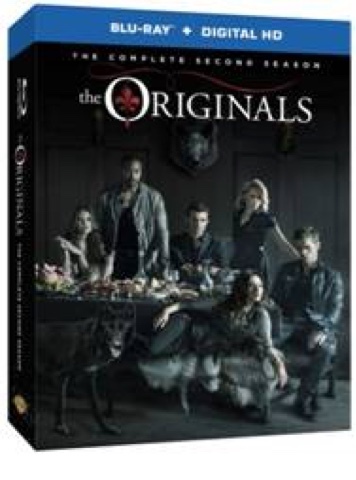 The Originals: The Complete Second Season will be priced to own on DVD at $44.98 SRP and on Blu-ray at $49.99 SRP. As Original vampire-werewolf hybrid Klaus Mikaelson returned to the vibrant, supernaturally charged city of New Orleans in season one, he was stunned to learn — along with his siblings Elijah and Rebekah — that Hayley, a werewolf, was pregnant with his child, and his vampire protégé, Marcel, whom the Original siblings had thought long dead, was ruling the French Quarter. Soon, a bloody war escalated between vampires and witches — the stakes raised by powerful teenage witch Davina and by Klaus’s bond with Cami, a student with a painful past — and a ruthless pack of wolves seized the opportunity to stage a violent coup. Now, in season two, a new status quo must be adjusted to, as the newly empowered werewolves control the city. Klaus struggles with weaknesses as Elijah desperately tries to save Hayley — now a hybrid — from a vicious spiral of self-destruction. Meanwhile, with the re-emergence of several Mikaelsons, “family is power” takes on new meaning. With Blu-ray’s unsurpassed picture and sound, The Originals: The Complete Second Season Blu-ray release will include 1080p Full HD Video with DTS-HD Master Audio for English 5.1. The 3-disc Blu-ray will feature a high-definition Blu-ray and a Digital HD copy of all 22 episodes from Season Two. Season Two of The Originals stars Joseph Morgan (The Vampire Diaries, Ben Hur), Daniel Gillies (The Vampire Diaries, Saving Hope), Phoebe Tonkin (The Vampire Diaries, The Secret Circle), Charles Michael Davis (Grey's Anatomy), Leah Pipes (Sorority Row), Danielle Campbell (Prison Break) and Yusuf Gatewood (The Interpreter), with Plec executive producing along with Michael Narducci (The Vampire Diaries, Medium) and Leslie Morgenstein (The Vampire Diaries, Pretty Little Liars). Created by Plec, the series is based in part on the character Klaus from The Vampire Diaries novels by L.J. Smith. The Originalswill continue for a third season on The CW in fall 2015. • In this featurette, we will hear from cast and creators on how season two explored new depths of what it means to be a family. • Explore this companion series on Kol Mikaelson (Nathaniel Buzolic) and his quest to form an alliance with the witches of New Orleans in 1914. Also, go behind the scenes with the cast and creators of the digital series. Celebrate Bastille Day at the movies with FIAF! Some Philosophizing By Mark Rivera. Rest In Peace Patrick Macnee. Purchased My First Mondo Art Print Poster Today. Seinfeld Fan Experience Opens In NYC. New Clip & from SELF/LESS In Theaters 7/10! Batman: Arkham Knight Is Here! Adult Swim Crash Lands At San Diego Comic-Con. LOOK WHO’S IN SHARKNADO 3: OH HELL NO!!! Rose McGowan's DAWN -- Trailer Now Available! New Poster from Elijah Wood's COOTIES! Very sorry. Unforeseen issue must take priority. FIRST LOOK AT THE ALL-NEW POWERPUFF GIRLS! Is This The Shape Of Disney Star Wars To Come? Watch Criterion Picks On Fandor In June, 2015. Enter Marvel's Ant-Man Micro-Tech Challenge! The Riddler & Mr. Freeze in Gotham Season Two?